Augmented Reality (AR) is a technology that has already started to shape our future. I partnered up with a local AR company (that was later acquired by Apple) to create Augmented Reality Magic – combining my traditional trickery with this up-and-coming technology. Now with iOS 11 on my iPad it was about time to come up with a technically improved version of my AR Money Magic. As always I was trying to find the premier partners in the market and I’ve succeeded: I found the #1 AR Platform ROAR. I sent a message to their website and got an immediate response the same day. And so we teamed up. 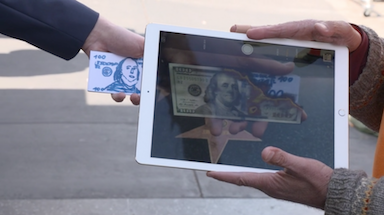 To thank ROAR AR I performed the new app right on the Walk Of Fame and made the special video above as a Thank you. ROAR is an augmented reality platform for brand owners. It is a content management system for AR, allowing anybody to build their own augmented reality experiences by simply adding images, videos, 3D models, CTA buttons, etc. The creation of an AR experience through the user-friendly Editor can be done in a few clicks without any technical knowledge required. You can either publish to the ROAR AR app, or they can build you a white label version that is custom made for you.